Creating a mobile app is exciting, and our expert team is fully capable of giving you something unique that will help grow your business. Mobile app development is serious business. It takes time and patience to create something that works for you and is free of bugs and other issues. Updates are required, but it’s important to start with a sound foundation. 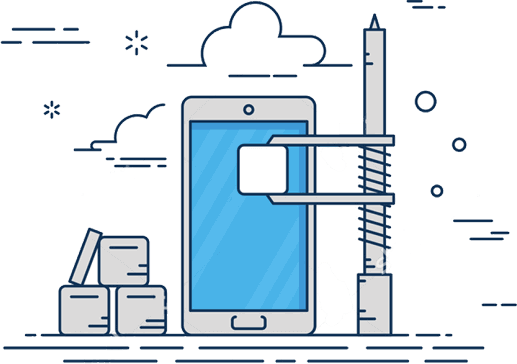 Being the top mobile app development company in Kuwait, we take extra care to spend time with our clients to understand the business and then help to create a blue print of the idea to paper in the form of wireframes. As a technology driven partner, we take pride to look into industry trends and latest technology advances to provide our customers with cutting edge solutions for their projects. We cannot be the top mobile app development company if we don't produce a workable strategy. Our mission is to deliver results based on validated approach which can be vetted with statistical data. Your success is our success and hence we work hard to make you achieve your goals. Mobility is not the future, it is our today. Apptology is an award winning web, cloud and mobile application development company in Kuwait. It does next generation mobile app development for iOS and Android platforms. It has been named among the top mobile application development companies. With 15 years of empirical understanding, it specializes in interactive design, strategy implementation, development and deployment of web and mobile apps for global clients to bring them AHEAD OF THE CURVE. Develop native & cross-platform mobile apps for multiple mobile OS - android, iphone, windows, blackberry. Hire mobile application development company top to build an app, which creates brand. Hire best android app development company , which builds intuitive user interfaces and custom functionalities including NFC to develop best in class android apps and games for smartphones and tablets. iPhone app development for your business, is key to connect to global audience. Hire top iphone app development company with great experience in developing custom iOS apps for all industries / verticals. Build the best of game by hiring top mobile game development company . The genres include action, adventure, arcade, board, music, racing, strategy, puzzle, and PRG. Gamer demographics included. Know more about Mobile Application Development. Catering to give you the direction and approach rather than selling you a solution. From Apps like Service Market to Uber, let us know your twist and we’ll add it ! We love building awesome Mobile Apps in Kuwait.